Sometimes the simplest things can be the most elegant. 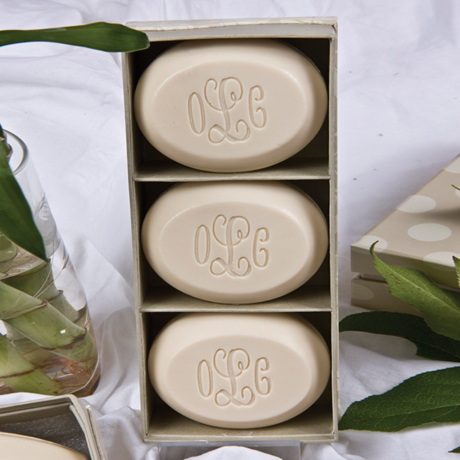 Impress your guests with soaps engraved with your monogram-or give them as a one-of-a-kind gift. Three creamy, luxurious, triple-milled bars arrive in a beautifully lined gift box. Soaps are vegetable-based and scented. Specify three initials (in this order: first, middle, last - monogram will position last name initial in the center), and choose Coconut Vanilla (cream), Green Tea (green), or Pomegranate (pink). Allow 1-2 weeks for delivery. No gift wrap, rush or overnight shipping. Item can only be shipped within the Continental US.